Reading has long been a favorite pastime of mine and the search for a good book never ends. A good beach read is even more important. While I have on occasion brought terribly sad books on trips to the beach, no one wants to sit sobbing on a tropical island, wiping tears away with sand covered hands as everyone else around them is enjoying the sunshine and sipping heavy handed rum concoctions. Like when my mom read The Shack in Tortola. Brittany Gibbons' Fat Girl Walking on the other hand, would make an excellent beach read. I didn't know much about Brittany or her story before I started reading, but it didn't take long to get sucked in. Her voice is so welcoming, by page two you've made a good old friend that you never want to stop talking because she is hilarious, kind of like the relationship Amy Poehler and I have in my daydreams. It's addicting. 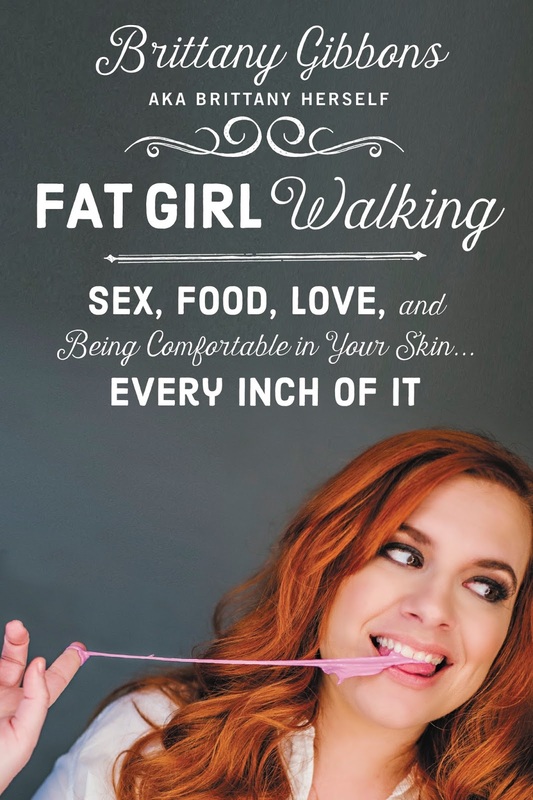 Fat Girl Walking is a memoir told in a series of smaller stories, all linked together in the bigger picture that is Brittany's life, and equally as important to shaping who she is now, how she arrived there. She is bold and unapologetic and puts it all out there, which at points makes it feel more like you're peeking into someone's personal diary. There are a few TMI moments as well, but I admire her for them, for her shamelessness. For someone who spent so much time writing about how embarrassed she has felt her entire life, she really goes for it. It's brave. My favorite bit was a wonderful gem of advice passed along from her grandmother - "you are going to fail at a lot of things, so when you do, do it on such a grand scale that half the room gives you a standing ovation, and the other half gives you the middle finger." I love that. It's such great advice. If you're going to fail, why not go the extra mile? Go big or go home. Overall, I think Brittany succeeds in her goal with this book to share her story the way she wants it to be told, not the way anyone else might like to spin it. I very much enjoyed it and would recommend checking it out. This book sounds amazing and such a fun read! Definitely going to have to download it for my next pool day for sure! Love that advice her grandmother gave her too! I'm excited to check this out! Definitely going to check this out! Emma | With A City DreamLove this! AH! Thank you so much for this recommendation. Buying this book ASAP! I haven't read in so long. Unfortunately I just don't have the time but this sounds like a great book and my goal this summer is to read at least 2 books. Sad since I used to read 1-2 a week.